She’s not the first to raise these concerns or ask us this question - one of the most common challenges clients come to us with is a dire need for customer insight, and market research is often the presumed solution. In reality, though, it’s only one half of the equation. Yes, interviewing customers in your target demographic will give you some useful takeaways. But often we see companies spending hundreds of thousands of dollars on market research and coming away with answers that they can’t actually tie back into their customer base. That’s why the best approach to the tricky challenge of intimately knowing and catering to your customer base is to lay a solid analytics foundation before diving into market research. In practise, this means first doing a customer segmentation - these segments are derived from your data and will be the best possible representation of your existing customer base. Then, by interviewing real-life people who fall under these segments, you can tailor your market research to the exact kind of customers your business is looking to attract and retain. The other reason it’s important to do a proper customer data analysis before jumping into market research is that you could save yourself a lot of time and money. Many of the questions asked during market research surveys are actually pre-emptively answered in your data (if you know where to look). Checking the data first allows you to eliminate redundant questions and focus any future market research on ones that you don’t already have the answers to. As you can see, these two activities go hand-in-hand. 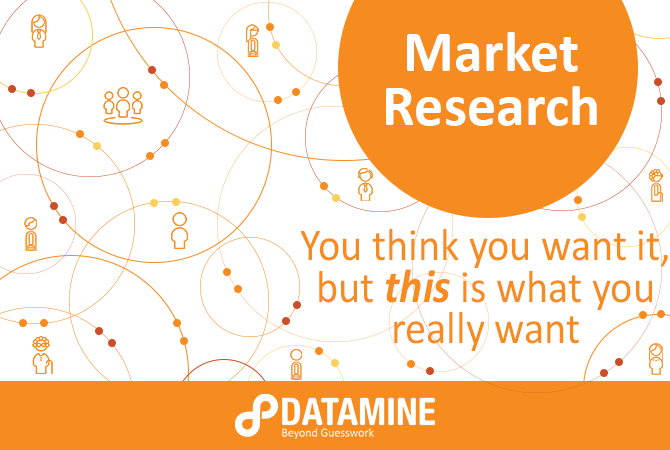 So when someone comes to Datamine looking for market research, we encourage them to first look for answers internally - if they still need more insight, doing external research can help fill in the gaps. Here is a breakdown of the different roles analytics and market research play in gaining customer insight. What are my customers’ buying patterns? How do customers respond to different discounts? How likely are customers to churn? How valuable are certain customers to the business? When put on the spot during an interview, customers might say that they would pay X for a product, or that they spent X amount at a company, or that would consider changing preferences if X happened. Taking this as the gospel truth, though, would be imprudent - people are prone to saying one thing and doing another. But the data doesn’t lie. How do you feel about X brand? What is your typical budget for X service or product? Where do you go when you want to buy X? What do you look for in an X service or product provider? What pain points do you have with X service or product? What do you hope to achieve by buying X service or product? Another area in which market research tends to be more useful than customer analytics is when already data-driven companies are looking into concept development, or buyer personas, or developing a system of training etc. In these cases, personal interviews tend to yield more applicable information than a data deep-dive would. Ultimately market research and customer analytics take different but complementary routes to achieve the same purpose - giving you a comprehensive view of your customer. And when you start that customer insight journey with a foundational analytics project, the subsequent market research can fill in the gaps and give you the rounded picture you need to optimise your customer interactions. For more information about gaining a better understanding of your customer, check out the Datamine Guide to Customer Insights to the right.